DEB ROBERTSON WRITES....: Have you seen this? or What's one more! Have you seen this? or What's one more! Elizabeth at Oh Franson! 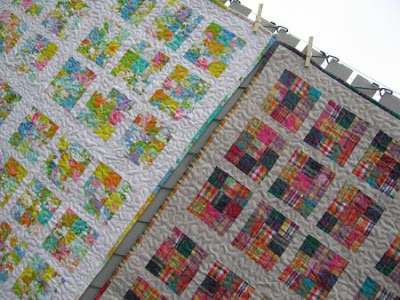 has posted the patterns to these lovely clothesline quilts. I just want to start mine now. I have 8 pillowcases, just have to find one more. Such loveliness... don't you think. Of course I should be quilting the five quilt tops I have, but hey... what's one more?? Ha! Incorrigable - although can I talk? How many hats can you have on the go at one time? LOL. So, you weren't kidding about enjoying the putting together, but not the quilting, huh? I really have never had that problem. I think I feel bad if I don't complete the entire project just as soon as I can, because I am afraid I will not get the chance to get back to it!